Celebrate summers spent by the water with these sweet dish towels, featuring iconic landmarks along a bright, infographic backdrop. The perfect way to remember vacation spots or the place you call home, each towel is highlighted by hand-dyed detail for a homespun touch of charm. Images may vary slightly due to revisions. Each towel is silk screened and then framed with a hand embroidered border on a 100% cotton dish towel. Made in India. Click here to see all available Coastal Dish Towels. Machine wash cold water; do not bleach. Product was a Christmas gift. It's become a holiday tradition that I buy these towels as gifts to remember our family's summer travels. They fade over time just like the memories,but every time we hold them, we smile with the memories! 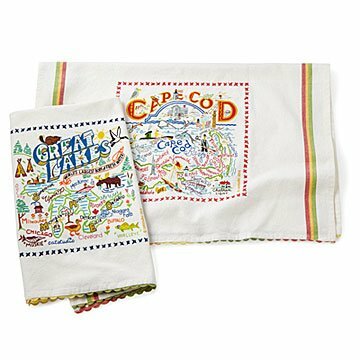 Celebrate your favorite locales with these bright dish towels, featuring an infographic of landmarks, names, and images of note.